Maggie, complete the following tasks. Good luck. Write a code that displays two lines in the command window and the trailing new line. Compile and run it to test it. The result should be similar to mine presented below; make sure the cursor start at new line). What is the structure of the C++ program required to properly compile and run? What is the statement that displays a text on a screen (text = string)? What do you need to include in the code to display the string on a screen? What character do you use to end a statement in C++? 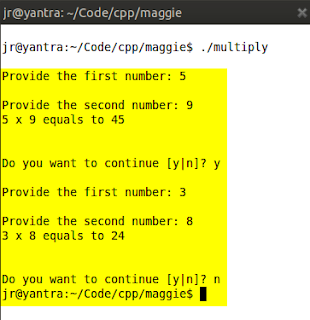 Write a code that asks a user for two integer numbers. The numbers should be multiplied and result displayed (look at the example below). The program should ask the user if she/he wants to do it again. What is the difference between do-loop and do-while-loop? What third type of loop do you know and in which situation would you prefer to use it rather than while-loop? What type of variable did you use to store user's answer to the question after showing the result? What other types of variables are used in C++? Can you tell the characters used for addition, subtraction, multiplication, division?